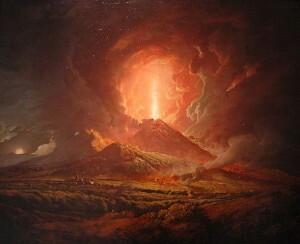 Vesuvius from Portici, by Joseph Wright, 18th-century English painter (Public domain, courtesy Titanic News Channel). The reader cringes at the irony, but neither party to this conversation realizes that within days–hours–Vesuvius will erupt and bury the town in pumice, ash, and molten rock. It’s testament to Harris’s skill that he fashions a much-storied historical event almost two millennia old into an edge-of-your-seat thriller, despite certain elements common to the genre and therefore predictable. How does he do it? By going against the grain. Harris could have focused on the victims, playing on their ignorance, innocence, and tragedy. There’s nothing wrong with that–we can all imagine unseen terrors striking us down–but Harris goes the other way. He shows the Pompeiians at their worst, whether the scheming politicians, the astonishingly greedy villain, his feckless friends and relations, or the townspeople, brutal, superstitious, and quick to anger. This setup gives the author wider scope. Not only does he ratchet up the tension over whether the evil will perish along with the good, his premise opens several roads to explore. One is the thirst for money (a metaphor of double meaning here). Another compares nature’s cruelty to the human variety; to no surprise, nature comes out the better, because its ravages imply no intent. But that proposition, which (a) has implications for what civilization means; and (b) suggests a random universe, troubles these Romans. As rulers of the known world, they assume their moral superiority and humanity, while as polytheists, they worry about offending capricious gods, so that there’s no such thing as a random act. However, not all Romans in this novel accept these common beliefs. Pliny the Elder, in these pages a vivid, significant character, sets higher store by observation than what Vulcan may or may not be up to beneath Vesuvius. So does the protagonist, Marcus Attilius. He’s a newly appointed aquarius, or engineer, who serves the Aqua Augusta, the aqueduct that supplies the region with water. 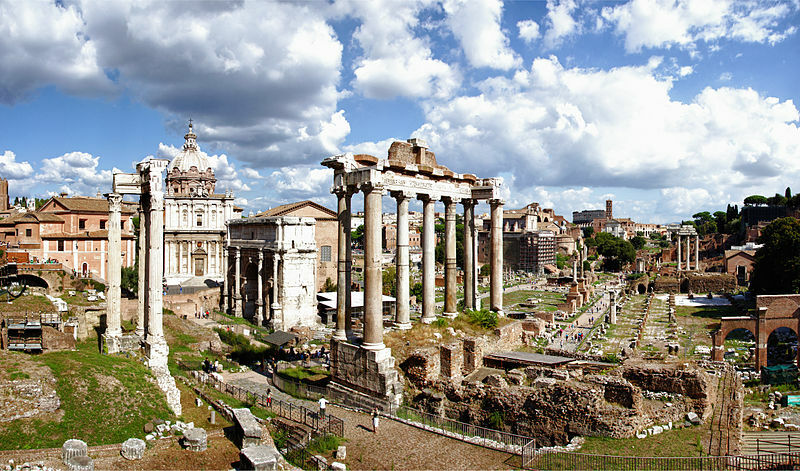 Attilius possesses several virtues on which ancient Romans prided themselves: honesty, courage, willingness to work hard for the common good, and the energy to sweat the details. Coming from a long line of aquarii, he discounts Vulcan’s wrath as the reason for a mysterious break in the Aqua Augusta and its pervasive odor of sulfur. But whatever the cause, it’s his job to repair the aqueduct and solve the mystery before the public realizes their water supply has failed. Trouble is, Ampliatus, the real estate magnate full of sage investment advice, has been building splendid baths in Pompeii, and he sees a large, illegal fortune to be made in water. (As a former slave who works rather too hard to enrich himself and burnish his reputation, he’s aptly named, for ampliatus means “to widen,” “to enlarge,” or “to glorify”.) 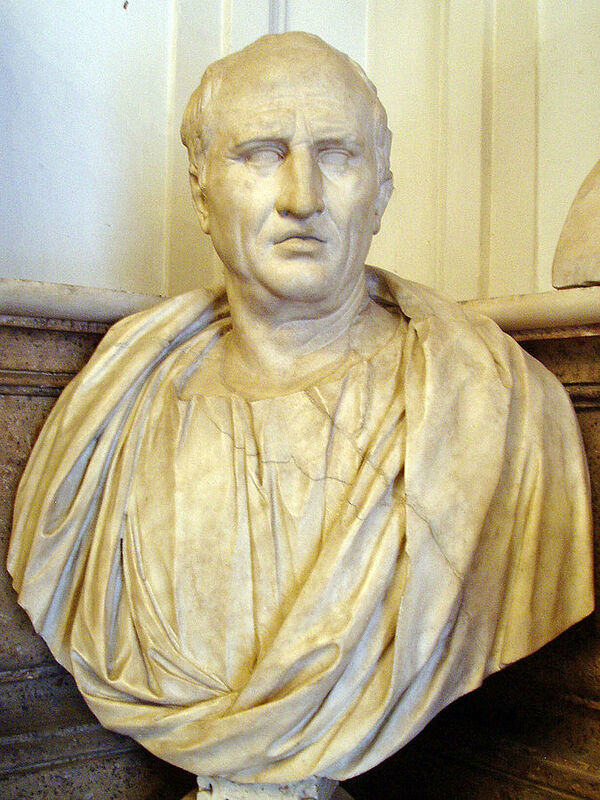 He quickly recognizes that Attilius will oppose him and takes steps to have him removed. Nobody will be surprised to hear that Ampliatus has a daughter, Corelia, whose beauty, sensitivity, and generous heart smite the stoic engineer between the eyes. Harris does tweak that cliché, though, loosening up his priggish protagonist as the novel proceeds, a nice touch. But Vesuvius, naturally, will have the last word over all petty, human affairs, which makes a normal engineering project a very tense activity. Harris has also researched his ground, to great effect. The houses feel lived in, the streets vibrant, and, important to a story like this, the engineering worthy of awe. I learned that the aqueduct builders sloped their pipelines a small, precise distance every hundred yards–roughly, the thickness of a human finger. Any less, and the water remained stagnant; any more, and the current destroyed the masonry. What a metaphor for the business of state or survival–a hair’s breadth off, and life ends, history changes. Like An Officer and a Spy, Harris’s superb novel about the Dreyfus Affair (reviewed March 9), Pompeii hews to events as they happened, yet still astonishes. If you read historical thrillers sparingly and prefer a deeper, more complex novel, try An Officer and a Spy first. But both will reward you.